Tone and strengthen your body with this continuous resistance band. 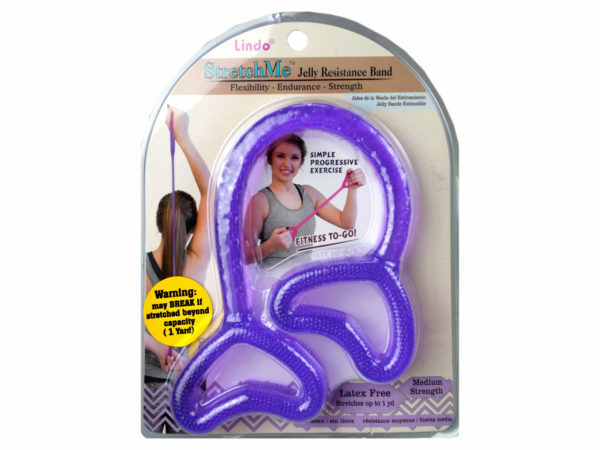 The Stretch ME Jelly Resistance band provides flexibility, endurance, and strength. It tightens and firms while strategically using low-impact training. The resistance band helps target specific muscle groups for total body conditioning. It is perfect for travel and stretches up to 1 yard. The medium strength Purple band is latex free. It comes packaged in a hanging blister pack of 9" x 6.75". The band is approximately 12.50" in length.